This is a two part adapter kit providing a way to temporarily plug SMT surface mount components to a circuit card under test. The bottom part (SMT base), is soldered to the PCB and replaces the component normally on the PCB card pads. The top part plugs into the SMT base and has ZIF socket to hold the SMT component. 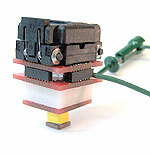 8DFN50-DFN-ZL-SD 8 pin QFN, (DFN), square SMT socket to 8 QFN pads adapter. This adapter is composed of two parts, a surface mount bed of nails base, and socket assembly with receptacle pins for the SMT base . Allows a QFN , (DFN), socket to be temporarily connected to a circuit board. Has a Plastronics 08QN12T16050 ZIF test burn-in socket. 16QFN26-QFN-ZL-SD2-P 16 pin QFN square SMT socket to 16 QFN pads adapter. This adapter is composed of two parts, a surface mount bed of nails base, and socket assembly with receptacle pins for the SMT base. Allows a QFN socket to be temporarily connected to a circuit board. Has a Plastronics 16QN65K14040 ZIF test burn-in socket. 16QFN39-QFN-ZL-SD2-P 16 pin QFN square SMT socket to 16 QFN pads adapter. This adapter is composed of two parts, a surface mount bed of nails base, and socket assembly with receptacle pins for the SMT base. Allows a QFN socket to be temporarily connected to a circuit board. Has a Plastronics 16QN10S16060-A ZIF test burn-in socket. 20QFN20-QFN-ZL-SD2-P 20 pin QFN square SMT socket to 20 QFN pads adapter. This adapter is composed of two parts, a surface mount bed of nails base, and socket assembly with receptacle pins for the SMT base . 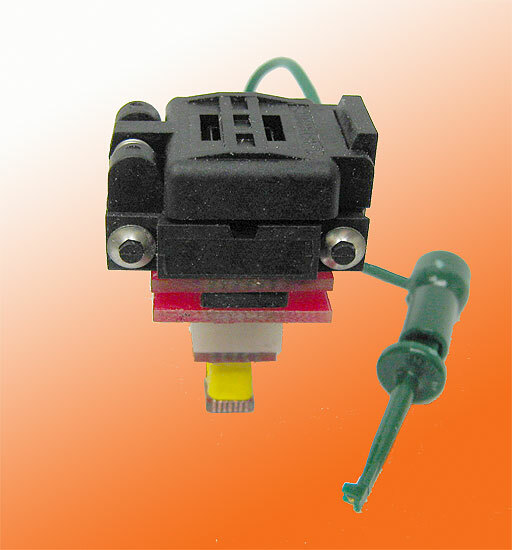 Allows a QFN socket to be temporarily connected to a circuit board. Has a Plastronics 20QN50K1404020 ZIF test burn-in socket. 20QFN26-QFN-ZL-SD2-P 20 pin QFN square SMT socket to 20 QFN pads adapter. This adapter is composed of two parts, a surface mount bed of nails base, and socket assembly with receptacle pins for the SMT base . Allows a QFN socket to be temporarily connected to a circuit board. Has a Plastronics 20QN65TSK15050 ZIF test burn-in socket. 24QFN20-QFN-ZL-SD2-P 24 pin QFN square SMT socket to 25 QFN pads adapter. This adapter is composed of two parts, a surface mount bed of nails base, and socket assembly with receptacle pins for the SMT base. Allows a QFN socket to be temporarily connected to a circuit board. Has a Plastronics 24QN50S14040 ZIF test burn-in socket. 28QFN20-QFN-ZL-SD2-P 28 pin QFN square SMT socket to 28 QFN pads adapter. This adapter is composed of two parts, a surface mount bed of nails base, and socket assembly with receptacle pins for the SMT base . Allows a QFN socket to be temporarily connected to a circuit board. Has a Plastronics 28QN50K15050 ZIF test burn-in socket. 28QFN26-QFN-ZL-SD2-P 28 pin QFN square SMT socket to 28 QFN pads adapter. This adapter is composed of two parts, a surface mount bed of nails base, and socket assembly with receptacle pins for the SMT base . Allows a QFN socket to be temporarily connected to a circuit board. Has a Plastronics 28QN65K16060 ZIF test burn-in socket. 32QFN20-QFN-ZL-SD2-P 32 pin QFN square SMT socket to 32 QFN pads adapter. This adapter is composed of two parts, a surface mount bed of nails base, and socket assembly with receptacle pins for the SMT base . Allows a QFN socket to be temporarily connected to a circuit board. Has a Plastronics 32QN50K15050 ZIF test burn-in socket. 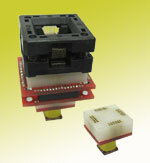 32QFN26-QFN-ZL-SD2-P 32 pin QFN square SMT socket to 32 QFN pads adapter. This adapter is composed of two parts, a surface mount bed of nails base, and socket assembly with receptacle pins for the SMT base . Allows a QFN socket to be temporarily connected to a circuit board. Has a Plastronics 32QN65K17070 ZIF test burn-in socket. 40QFN20-QFN-ZL-SD2-P 40 pin QFN square SMT socket to 40 QFN pads adapter. This adapter is composed of two parts, a surface mount bed of nails base, and socket assembly with receptacle pins for the SMT base . Allows a QFN socket to be temporarily connected to a circuit board. Has a Plastronics 40QN50K15050 ZIF test burn-in socket. 44QFN20-QFN-ZL-SD2-P 44 pin QFN square SMT socket to 44 QFN pads adapter. This adapter is composed of two parts, a surface mount bed of nails base, and socket assembly with receptacle pins for the SMT base . 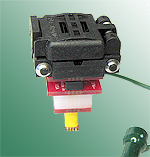 Allows a QFN socket to be temporarily connected to a circuit board. Has a Plastronics 44QN50K15050 ZIF test burn-in socket. 48QFN20-QFN-ZL-SD2-P 48 Pin 7x7mm square QFN, 0.5mm pitch open top socket to circuit card 7x7mm square QFN 0.5mm pitch surface mount pads. 48QFS20-QFN20-ZO-SD2 48 Pin square QFP 0.5mm pitch open top socket to circuit card QFN 0.5mm pitch, surface mount pads. 56QFN20-QFN-ZL-SD2-P 56 Pin square QFP 0.5mm pitch closed top socket to circuit card QFN 0.5mm pitch, surface mount pads. 64QFN20-QFN-ZL-SD2-P 64 Pin square QFP 0.5mm pitch closed top, clamshell type socket to circuit card QFN 0.5mm pitch, surface mount pads.